We all sleep in various positions – on the back with arms thrown to the sides, on the tummy with arms hugging the pillow, on the side with arms straight along our bodies and so on! Usually, nobody sleeps in one single position through the night – we keep turning over or changing. That's probably why some of us find our pillows and blankets (and sometimes our partners) on the floor in the morning. Perhaps you're a back sleeper or a tummy sleeper (the worst sleeping position), and your current favorite sleeping position isn't working for you anymore. Or you've heard about some benefits of sleeping on your side, and you want to switch over. For instance, sleeping on your side is recommended for issues like Sleep Apnea (according to various studies including this report by the University of Maryland Medical Center). Also, if you suffer from temporary respiratory problems like a blocked nose, sleeping on your side can help clear your airways. Well, sleeping habits are hard to change, but not impossible. 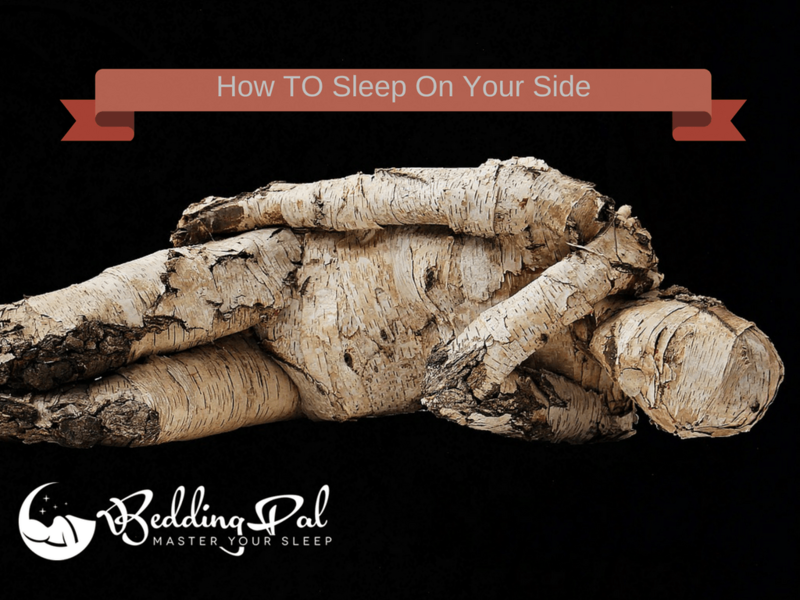 Read on to learn how to sleep on your side (the right way). When you sleep on your side, the most pressure is applied on your hips, neck, and shoulders. For this reason, a too-firm mattress can cause pain in those areas. Look for a mattress that is soft enough not to hurt your body, but provides adequate support so that your body doesn't sink in and adversely impact the alignment of your spine. Try a few products before buying one. The general principle for proper spinal support when lying on your side is that your neck, spine, and hips should be aligned in a straight, neutral position. It can be achieved by using a side sleeper pillow that's high enough to bring your neck to the same level as the other two. If your head sags downwards, it puts a lot of strain on your neck which in turn is the perfect recipe for severe neck pain the next morning. The firmness of the pillow also matters as a too-soft pillow will just sink under your head with the same result as a flat pillow. So, if you are suffering from neck pain, pick a pillow that is just high enough and firm enough to support your neck correctly. If your top leg (the leg on the side you're not lying on) is left unsupported, it can sag down and put a strain on your hips and spine. To correct this, put a thin pillow between your knees or get a perfectly﻿ designed knee pillow so that some of the stress on your hips and lower back is relieved. A rolled up towel can also be used for this purpose. Bend your legs slightly at the knee but not too far towards your stomach to avoid lower back pain. According to a study by the Journal of Clinical Gastroenterology, sleeping on the left side is better to avoid heartburn. As we all know, old (sleeping) habits die hard, so even if you start off on your side, you may wake up on your tummy or back the next morning. To train your body into staying in the side position, try sleeping on a sofa for a few nights so that the narrow space will prevent you from rolling into another position. Another trick is to use a full body pillow to keep you in position. Keep track of how you wake up in the morning – if it's on your side, you're headed towards success! One of the possible downsides to sleeping on your side is that your arm/hand can go numb if you use it as a pillow (on top of your actual pillow). It is because your blood circulation is cut off by the pressure of your head and body weight, causing your arm to “fall asleep” (go numb) and you to wake up from the resulting uncomfortable prickling sensation. To prevent this from happening, avoid putting your arm under your head, and make sure your pillow is providing adequate support for your head. Studies show that the most common sleeping position is, in fact, on the side, in a fetal position. UK sleep expert Dr. Chris Idzikowski tells us about his survey that yielded this result, in a BBC article. Preferred sleeping positions may change over time due to environmental factors or other reasons like pregnancy, injuries, indigestion issues, etc. which prevent you from sleeping in certain positions. For instance, a wound in your back can mean you have to sleep on your side or stomach till it heals. Of the three major sleeping positions, the side sleeping position is second only to sleeping on the back. So if you find yourself unable to sleep on your back anymore for some reason, switch to your side – not your tummy. For those of you who are reading this just before bedtime and want to try it out at once, go ahead - make yourself a cup of warm sleepy-time tea, hit the sack and put our tips into practice. Sweet dreams!